A brilliant Harrogate electronica singer-songwriter is preparing to appear in Leeds Festival at Bramham Park as the event gets under way in earnest today. Scott Quinn will be playing the BBC Music Introducing stage third top on the bill tomorrow, Saturday at around 7pm. Another Harrogate link comes with cracking a Leeds rock band who recently headlined Harrogate's recent Spirit of 67 multi-media day. Psychedelic blues rock n roll band The Strawberries, from Hyde Park in Leeds, made a big impression in Harrogate at The Factory at Poliform North and will now be seen on the Jack Rocks stage at Leeds Festival..
Now Sam Neil (vocals/guitar), Ethan Lee Sherwin (bass/vocals), Joe Dines (guitar) and Ben Heath (drums) will play the Jack Rocks stage where Cabbage made a big splash next year. Spirit of 67 co-organiser Graham Chalmers said: "The Strawberries were great in Harrogate - a proper rock n roll band the likes of which we haven't seen for years. "But Scott Quinn is a huge talent. 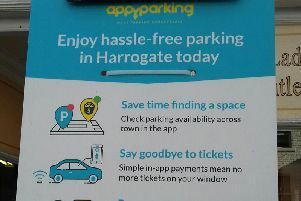 Harrogate is on the rise!" As well as main stage headliners Muse, Kasabian and Eminem, a slew of other new acts will be seen at Leeds on the BBC Music Introducing stages at this year's Leeds Festival at Bramham Park which runs from August 24-26. Announced by BBC Radio 1 DJ Huw Stephens, a host of rising stars will appear over the three days on the BBC Music Introducing stage. Friday at Leeds Festival will see live performances on the BBC Music Introducing stage by Alibi, Anna Straker, Chroma, Deadset Dream, Ginger Snaps, Honey Lung, Low Island, Mosa Wild, Penguin, Queen Zee and The Sasstones, Rock Bottom Risers, and The Pale White. Saturday will see Avenoir, Brooke Bentham, Honey Arcade, Moses, Olly Chamberlain, Phundo Art, Plaza, Rale, Scott Quinn, Sugarman, The Golden Age of TV and TOUTS. Finally, Sunday will see Cassia, Colouring, Dan Stock, Ider, Island, KOYO, Pale Waves, Playing House, Sœur, Too Many Ts, Verschieden and Will Sin For Love. All the regionally-based bands will also appear on alternate days at Reading Festival. Huw Stephens said: “Reading and Leeds is a huge deal for music fans and playing it is an even bigger deal. "BBC Music Introducing is a really exciting part of the festival now, showcasing new talent that’s breaking through and championed by the shows that nominate them to play. "Festival-goers will see something new and awesome every time you stop by."